Where Where You When the Lights Went Out? 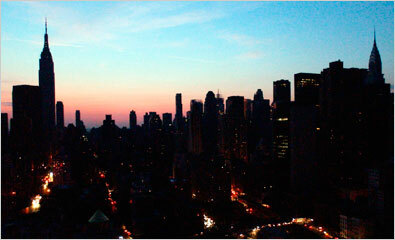 10 years ago, the East Coast succumbed to darkness for 29 hours straight. At the time, I worked in an office near Wall Street in Manhattan. At first everyone thought it was a terrorist attack. Like thousands of others, I found a pay phone--I didn't have a cell phone back then--and called my parents and close friends to let them know I was OK and to ask how they were doing. I'd just moved to Park Slope, Brooklyn, and after walking across the Brooklyn Bridge, I had to rely on the kindness of strangers to find my way back to my apartment. I listened to the news on a battery-powered radio, relieved to know the blackout wasn't the work of terrorists.